This report includes a new assessment from an equity analyst view of the financial crisis of the nuclear sector and some of its biggest industrial players. The Fukushima status report provides not only an update on onsite and offsite issues six years after the beginning of the catastrophe, but also the latest official and new independent cost evaluations of the disaster. Focus chapters provide in-depth analysis of France, Japan, South Korea, the United Kingdom and the United States. The nuclear power vs. renewable energy chapter provides global comparative data on investment, capacity, and generation from nuclear, wind and solar energy. Finally, Annex 1 presents a country-by-country overview of all other countries operating nuclear power plants. In 2016, ten reactors started up: five in China, one each in India (Kudankulam-2), Pakistan (Chasnupp-3), Russia (Novovoronezh-2-1), South Korea (Shin-Kori-3) and the US (Watts Bar-2, after 43 years of construction). Two reactors were closed in 2016: Novovoronezh-3 in Russia and Fort Calhoun-1 in the US. In the first half of 2017, two reactors started up: one each in China (Yangjiang) and Pakistan (Chasnupp-4, built by a Chinese company), while two were shut down: the oldest units respectively in South Korea (Kori-1, after 40 years of operation) and in Sweden (Oskarshamn-1, after close to 46 years of operation). There are 31 countries operating nuclear power plants. These countries operate a total of 403 reactors – excluding long-term outages (LTOs) – just one unit more compared to the situation mid-2016, 35 fewer than the 2002 peak of 438. The total installed capacity increased over the past year by less than 1% to reach 351 GW, which is comparable to levels in 2000. Installed capacity peaked in 2006 at 368 GW. Annual nuclear electricity generation reached 2476 TWh in 2016 – a 1,4% increase over the previous year, but about 7% below the historic peak of 2006. As in 2015, the 2016 global increase of 35 TWh is due to the production hike in China, where nuclear generation increased by 23% or 36,6 TWh. The nuclear share of the world’s power generation remained stable over the past five years, with 10,5% in 2016 after declining steadily from a historic peak of 17,5% in 1996. Nuclear power’s share of global commercial primary energy consumption also remained stable at 4,5% – prior to 2014 the lowest level since 1984. The “big five” nuclear generating countries by rank, the US, France, China, Russia, and South Korea, generated 70% of the world’s nuclear electricity in 2016. China moved up one rank. The US and France accounted for 48% of global nuclear generation. In the absence of major new-build programmes apart from China, the unit-weighted average age of the world operating nuclear reactor fleet continues to rise, and by mid-2017 stood at 29,3 years. Over half of the total, 234 units, have operated for 31 years and more, including 64 which have run for 41 years and more. The extension of operating periods beyond the original design is regulated differently from country to country. While in the US, 84 of the 99 operating reactors have already received license extensions for up to a total lifetime of 60 years; in France, only 10-year extensions are granted and the safety authorities have made it clear that there is no guarantee that all units will pass the 40-year in-depth safety assessment. Furthermore, the proposals for lifetime extensions are in conflict with the French legal target to reduce the nuclear share from the current three-quarters to half by 2025. 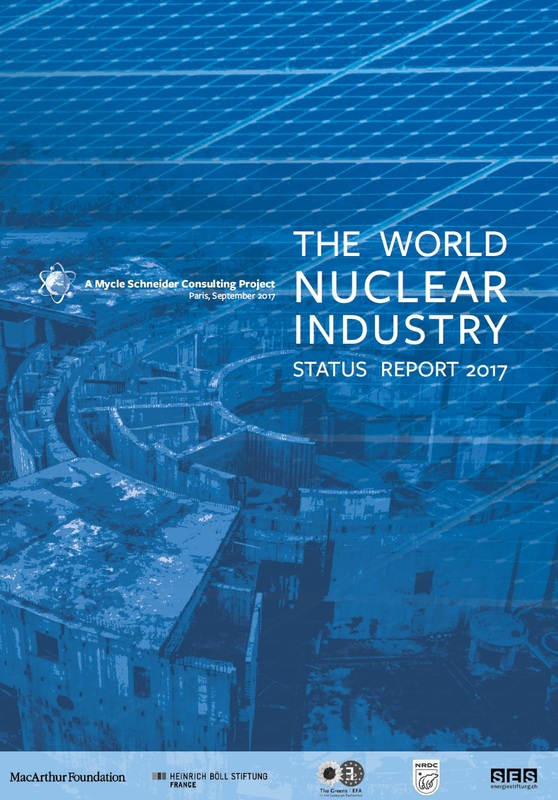 If all currently operating reactors were shut down at the end of a 40-year lifetime – with the exception of the 72 which have passed the 40-year mark – by 2020 the number of operating units would be eleven less than the total at the end of 2016, even if all reactors currently under active construction were completed. The installed capacity, however, will increase by 4 GW, because many of the older units have lower power outputs when compared to most of the reactors currently under construction. In the following decade, between 2020 and 2030, 194 units (179 GW) would have to be replaced – almost four times the number of startups achieved over the past decade. If all licensed lifetime extensions were actually implemented and achieved, the number of operating reactors would still increase by only five, and add 16,5 GW in 2020. By 2030, 163 reactors would have to be shut down and the loss of 144,5 GW would have to be compensated for. Thirteen countries are currently building nuclear power plants, one less than in previous years. Construction at the only new-build project in Brazil, Angra-3, was halted after corruption charges were brought against senior management. As of 1 July 2017, 53 reactors were under construction – five less than one year earlier and 15 fewer than in 2013. Twenty of the 53 reactors are being constructed in China. Total capacity under construction is 53,2 GW (–8%). The current average time since work started at the 53 units under construction is 6,8 years, an increase of 0,6 years from the status one year ago. The main reasons are the low number of construction starts and new delays. At mid-2017, eleven of 17 scheduled startups for the year had already been pushed into 2018 or beyond. All of the reactors under construction in eight out of the 13 countries have experienced delays, mostly by a year or more. Over two thirds (37) of all construction projects are behind schedule. Most of the 16 remaining units under construction, of which nine are in China, were begun within the past three years or have not yet reached projected start-up dates, making it difficult to assess whether or not they are on schedule. Of the 37 reactors behind schedule, 19 have reported increased delays over the past year since WNISR2016. Construction of three reactors which started more than 30 years ago: Mochovce-3 and -4 in Slovakia and Rostov-4 in Russia. Two units, the Prototype Fast Breeder Reactor (PFBR) in India and Olkiluoto-3 in Finland, have been listed as “under construction” for a decade or more, while Shimane-3 in Japan and Flamanville-3 in France will reach ten years of construction before the end of 2017. The average construction time of the latest 51 units in ten countries which started up in the past decade, since 2007, was 10,1 years with a very large range from 4 to over 43 years. In 2016, construction began on three reactors, two of which were in China and one in Pakistan (by a Chinese company). This compares to 15 construction starts – of which ten were in China alone – in 2010. In the first half of 2017, only India started building a reactor. Historically, construction starts in the world peaked in 1976 at 44. Between 1977 and 1 July 2017, a total of at least 91 (one in eight) of all construction sites were abandoned or suspended in 17 countries in various stages of advancement. Only two newcomer countries are actually building reactors: Belarus and UAE. Progress was halted at Belarus’ Ostrovets project, when the reactor pressure vessel was dropped during installation and had to be replaced. The UAE announced that it had to delay startup of the first of four units to 2018, due to a lack of locally trained and licensed domestic personnel. Further delays have occurred over the year in the development of nuclear programmes for most of the more or less advanced potential newcomer countries, including Bangladesh, Egypt, Jordan, Poland, Saudi Arabia, and Turkey. Vietnam abandoned its new-build project due to slowing electricity demand increases, concerns over safety and rising construction costs. Following technical problems, delays and massive cost overruns at its US construction projects V.C. Summer and Vogtle, the Japanese group Toshiba, in March 2017, filed for bankruptcy protection of its US subsidiary Westinghouse. As a consequence, construction at the two V.C. Summer reactors in the US was halted. The French state-controlled integrated nuclear company AREVA went technically bankrupt after a cumulative six-year loss of US$12,3-billion. The French government has provided a bailout of US$5,3-billion and continued a break-up strategy which has state utility EDF take over the nuclear building and services subsidiary AREVA-NP. The rescue scheme has been approved by the European Commission. AREVA has been delisted from the Paris stock market since August 2017. The embattled company is struggling also with a vast quality-control scandal that led to the provisional shutdown of a dozen reactors in France. Thousands of fabrication dossiers have to be examined for irregularities or falsifications. The safety implications remain to be assessed. Many of the traditional nuclear and fossil fuel based utilities continue to struggle with low wholesale power prices, a shrinking client base, declining power consumption, high debt loads, increasing production costs at aging facilities, and stiff competition, especially from renewables. Europe: Energy utilities Centrica (UK), EDF, Engie (France), E.ON, and RWE (Germany) have all been downgraded by credit-rating agencies over the past year. As of early July 2017, compared to their peak values during the past decade, the utilities’ shares had lost most of their value: RWE (-82%), E.ON (-87%), EDF (-89%), Engie (-75%). Asia: The share value of Japanese utility TEPCO, de facto nationalised after the Fukushima disaster, as of early July 2017, was still 89% below its February 2007 peak value. Toshiba, hit by the bankruptcy of its US subsidiary Westinghouse, saw its share value shrink again to a quarter of its 2007 peak level. Chinese utility CGN, listed on the Hong Kong stock exchange since December 2014, has not recovered from the 60% loss of its share value compared to the peak in June 2015. The Korean utility KEPCO, the only major nuclear utility to reach its peak share value in 2016, has lost 37% of its value over the past year following tariff cuts, increased operating expenses and the temporary shutdown of four reactors. The election of a new president exacerbates the situation. Lower electricity and commodity prices, added to increased competition and the implementation of the country’s Energiewende have led private utilities RWE and E.ON to make the strategic choice to split themselves in two. They separated their generation and trading activities from network operations and renewables in an attempt to reduce their exposure to commodity price movements, while providing new growth opportunities and value creation. Following this, the German government set up an independent commission (KFK) to review the process. As a result, the German government created a sovereign nuclear waste fund to cover future storage costs, transferring the risk from operators to the government. The positive effect from a lower cost of debt following the financial crisis had additional effects on nuclear operators. As in many cases nuclear generators are also operators on electricity networks, allowed returns have been revised downwards by regulators to avoid excessive gains. Moreover, lower interest rates imply that nuclear operators have to set aside more money today for future expected costs, increasing the total amount of provisions required. Emission trading system (ETS) prices are near historical low levels, while new measures have been taken by the European Union to boost prices in the mid-term by reducing allowance supply. New trading systems are being implanted to comply with COP21 agreements. Power prices touched historical low levels in the first half of 2016, with a rebound on the second half, which continued in 2017. The increase has been driven by a rebound on coal prices added to capacity shortages in France due to a lower nuclear generation from reactor inspections concerning the AREVA manufacturing irregularities. The rebound should positively impact earnings from 2018 onwards, but profits in 2017 are expected to tighten further as most of the generation has already been contracted at a lower price level. Six and a half years have passed since the Fukushima Daiichi nuclear power plant accidents on 11 March 2011. A number of onsite and offsite challenges have arisen since and remain significant today. The latest revision (June 2016) of the government’s mid-and-long-term roadmap fixed new target dates, some of which, one year later, are already outdated. Spent fuel removal: Spent fuel was to be removed from unit 3 in financial year (FY) 2017, but is now envisaged for the middle of 2018. Spent fuel removal from unit 1 was to be carried out by FY 2020 and is now scheduled for in 2021 at the earliest. No new timescale is available for unit 2. Molten fuel removal: Radiation levels remain very high inside the reactor buildings and make human intervention impossible. Fuel debris removal at unit 1 has been delayed to start in 2021. A robot was introduced into unit 2, but it got stuck in debris. No conclusive video footage is available and it remains unknown where the molten fuel is actually located. A radiation dose level of 210 Sv/h has been measured close to the pressure vessel. Contaminated water management: Every day, more than 200 m3 of water are injected into the three reactor cores to cool the molten fuel. The highly contaminated water runs out of the cracked containments into the basement where it mixes with water that has penetrated the basements from an underground river. A frozen soil wall that was designed to reduce the influx of water was commissioned at end of March 2016. Its effectiveness is limited and has only reduced the influx of water from 760 to 580 m3 per day. The cumulated amount has increased by 100 000 to 750 000 m3 over the past year. The commissioning of a dedicated bypass system and the pumping of groundwater has reduced the influx of water into the basements to about 130 m3/day. An equivalent amount of water is decontaminated to some degree, but still contains very high levels of tritium (over 500 000 Bq/l) and is stored in large tanks. Workers: About 8000 workers per month are involved in decommissioning work. Several fatal accidents have occurred at the site. In December 2016, the Ministry of Health recognised, for the first time, the thyroid cancer developed by a TEPCO employee in his forties as occupational disease. The future of tens of thousands of evacuees, the assessment of health consequences of the disaster, the management of decontamination wastes and the costs involved range amongst the main offsite challenges. According to government figures, the number of evacuees from Fukushima Prefecture as of March 2017 was about 79 000 or less than half of almost 165 000 in May 2012. On 31 March/1 April 2017, the government lifted restriction orders for 32 000 people. According to a survey of residents’ intentions conducted by the Reconstruction Agency, at most only 18% of previous residents desired to return in each of three of the five municipalities located in the evacuation zones. The government has decided to terminate the monthly compensation of about US$900 per person by March 2018 for all evacuees, except for those from so-called difficult-to-return areas for which there is no plan to lift the evacuation order. Compensation for some 12 400 Fukushima Prefecture households which evacuated voluntarily was terminated in March 2017. The social effects of this termination are severe. The controversy around health effects, especially thyroid cancer, continues. At present, the number of cancer cases found in children is about 30 times that of the national average. The official survey consistently stated that “it cannot be concluded whether or not the incidences of thyroid cancer found in the examination are due to exposure from the Fukushima accident.” This implies that a causal effect cannot be excluded. By the end of March 2017, 22 000 residential areas, 8500 hectares (ha) of farmland, 5800 ha of forest and 1400 ha of roads had been “decontaminated”. While the Environment Ministry claims dose rate reductions at 1 m above ground between 61% on roads and 71% on residential land, the effectiveness of these measures remains questionable, especially in the case of wooded areas which have only been decontaminated up to a radius of roughly 20 m around homes. Official cost estimates have doubled over the years and increased by one third over the past year to reach about US$200-billion, of which 36% is for decommissioning and compensation; 18% is for decontamination and the remaining 10% is for interim storage of waste. A new independent assessment has put the cost at between US$444- and 630-billion (depending on the level of water decontamination). 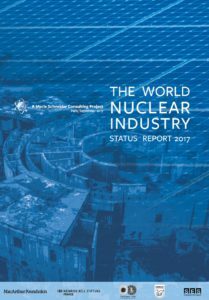 WNISR2017 provides an update of the 2015 assessment of the status of SMR programmes around the world. While some designs advanced to the construction phase with one reactor in China scheduled for startup in 2018, global interest in the technologies has faded. Some of the most promising designs (SMART in South Korea and mPower in the US) have not found any buyers. While SMRs were meant to solve the size issues (capacity and investment) of large nuclear plants, they are affected by the general decline in interest in nuclear new-build. After an all-time high of over US$310-billion in 2015, global investment in new renewable energy based electricity generating capacity dropped to about US$240-billion. However, the 23% fall in investment volume mainly reflects the rapid reduction in costs per GW as total renewable capacities installed in 2016 (excluding large hydro) added up to 138,5 GW, more than 127,5 GW the year before. Renewables accounted for 62% of additions to global power generating capacity. China remains the largest investor with US$78-billion, doubled its solar capacity to a cumulated 78 GW and added 20 GW of wind power capacity to reach just under 150 GW in total, more than all of Europe combined. This compares with China’s addition of 4,6 GW of nuclear capacity in 2016 to reach a total of 32 GW. Net global increase of nuclear capacity in 2016 was 9 GW – vs. a record 75 GW for solar and 55 GW for wind – and was limited to 3 GW over the year since July 2016. Since 2000, countries have added 451 GW of wind energy and 301 GW of solar energy to power grids around the world, which dwarfs the increase of only 36 GW, including all reactors in LTO status, in nuclear power capacity over the same period. Taking into account the fact that 36 GW of nuclear power were in LTO as of the end of 2016, and thus not operating, the current nuclear capacity is just the same as in 2000. Brazil, China, Germany, India, Japan, Mexico, the Netherlands, Spain and the UK – a list that includes three of the world’s four largest economies – all generate more electricity from non-hydro renewables than from nuclear power. In 2016, annual growth rates for global generation from solar was 30%, for wind power almost 16 %, and for nuclear power 1,4%, exclusively due to China. Compared to 1997, when the Kyoto Protocol on climate change was signed, in 2016 an additional 948 TWh of wind power was produced globally and 332 TWh of solar photovoltaics electricity, compared to nuclear’s additional 212 TWh. In China, as in every year since 2012, electricity production from wind alone (241 TWh), exceeded that from nuclear (198 TWh) in 2016. The same phenomenon is seen in India, where wind power (45 TWh) outpaced nuclear (35 TWh) again. In fact, while annual Indian nuclear power generation increased by 5 TWh since 2014, solar power alone added 7,5 TWh over those two years. The figures for the European Union illustrate the rapid decline of the role of nuclear: between 1997 and 2014, wind produced an additional 293 TWh and solar 111 TWh, while nuclear power generation declined by 82 TWh. New renewables come in cheaper than operating and maintenance costs of existing nuclear power plants. Renewable energy auctions achieved record low prices at and below US$30/MWh in Chile, Mexico, Morocco, United Arab Emirates, and the United States. In comparison, average generating costs of amortised nuclear power plants in the US, about one quarter of the world’s nuclear fleet, stood at US$35,5 in 2015. The post Status of the international nuclear industry appeared first on EE Publishers.